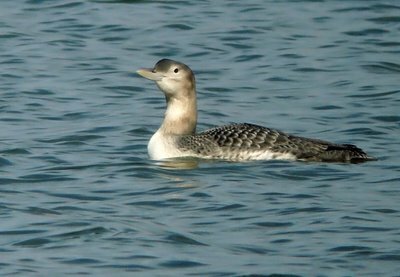 As if the Yellow-billed Loon wasn't enough, another species new to the Boulder County list arrived last week. 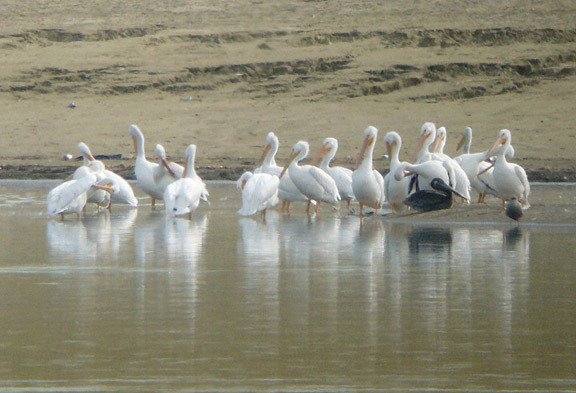 Ted & Hannah Floyd were walking around McIntosh Lake in Longmont on November 26 when they spied a Brown Pelican hanging out with some late American White Pelicans. Ted had the goodness to call me- I happened to be out walking with my own youngster, Garrett. Well, since I was only seeing Rock Pigeons at my current position, I hustled back home, jumped in the birdmobile, and drove up to McIntosh. Sure enough, on the far shore there was a brown lump amongst roosting gulls and white pelicans. After a while, a head with a long yellow bill emerged from the lump as the Brown Pelican decided to preen a bit instead of just sleeping. 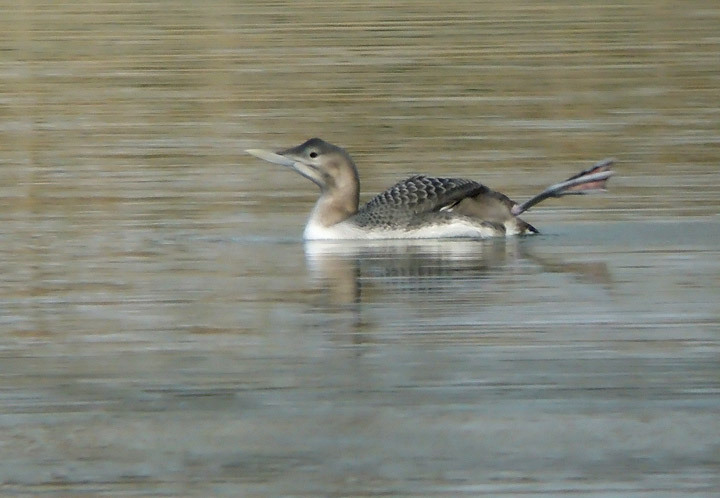 I shot some stills and videoscoped the bird from prohibitive range (about 1/2 a mile across the lake) before heading around to the north side where the bird was resting. Of course, right as I was showing up there a Bald Eagle flushed everything off the beach, but on a hunch I set up my scope and camera anyway. Sure enough, Brownie circled the west end of the lake and headed back. I somehow found it in flight and videoscoped it coming in for a landing. The Brown Pelican is almost certainly the same bird that has been hanging around Northern Colorado this summer and fall- it is a sub-adult that had been spending most of its time in the Loveland area (Larimer County) but has also been seen in Weld and Morgan Counties. Truly a county-lister's delight- a very rare bird that shares the wealth. After a sub-zero low in Longmont last night, though, I suspect the thing will either come to its senses and get out of town or end up as eagle chow. Lake McIntosh has kind of been a disappointing place every time I visited it until this week- I hadn't seen much besides a few un-noteworthy gulls and waterfowl. Well, that has changed! 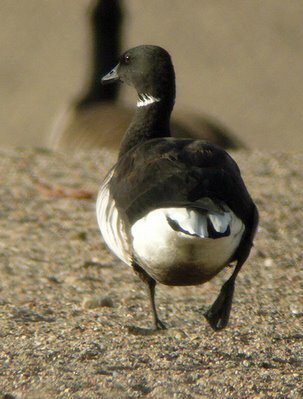 Bill Kaempfer alerted folks that the place was hopping after he surveyed it for the Rocky Mountain Bird Observatory's Early Winter Waterfowl Count. Seems like the shad have peaked, and there is a daily feeding frenzy of 1000's of gulls and mergansers and a dozen+ Bald Eagles. Plus a small group of Sandhill Cranes has headquartered there for at least a week, giving folks a chance to see a species that otherwise is usually just a flyover bird in the county. Ever the larid-lover, Tony Luekering worked the gull flock after ticking the BRPE and found a very interesting young gull that has traits consistent with Slaty-backed. Exciting stuff, but the bird has proven difficult to study or photograph well, and its true identity may remain in question. Danged immature gulls! Anyway, even if it doesn't get any more status than a maybe or what-if bird, it was fun going on the chase again. As long as some open water remains this should be a good gull spot- already in addition to the Slaty-backed-thingy Gull there have been a Mew and several Thayer's Gulls spotted amongst the Ringers, Herring, and California Gulls there. Today (Nov. 24) was a different story- the wind was light and the bird was taking it easy. In about two hours of observation it only dove for one brief period, catching sizable prey and swallowing it. For the rest of the time the bird lazed around, appearing to sleep when it wasn't preening. 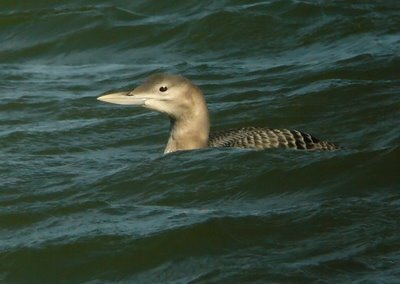 The bad news was that the bird didn't get as close as it did two days ago in the wind, but after a while it was well within good digiscoping range. After shooting a bunch more stills, I got the idea to try shooting some digiscoped video- what would you call that, videoscoping? All I can say is gee, why didn't I try this before? I just kept everything the same on my digiscoping rig and switched the camera to video mode. It appears as though YouTube compresses the video quite a bit so it doesn't look as clean as I'd like. Good news is it streams pretty well on most reasonably fast connections. If you have fast internet service you can try this link to a better version, although it is about 6 MP. The original is the best, but at 82 megs you'll have to come on over to see it. Here are a couple of stills from today. Notice the pink webbing on the foot- sweet, huh? Reminds me of the yellow webbing on a Wilson's Storm-Petrel foot. Know of any other birds with brightly colored webbing but dark toes? Unfortunately, the bird appears to have an injury on the lower right side of its neck. Maybe it was injured by an eagle, or maybe got a fishing hook gouge? Both times I went to see the bird it seemed to be spending a lot of time preening, especially its neck. 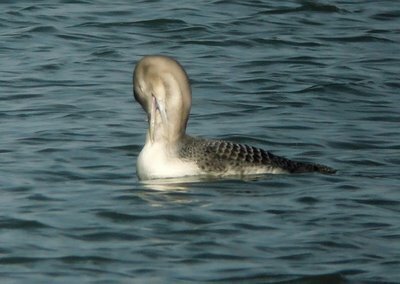 Today Brian Gibbons and I also noticed that it was keeping its right eye closed a lot, even when it seemed to be awake. 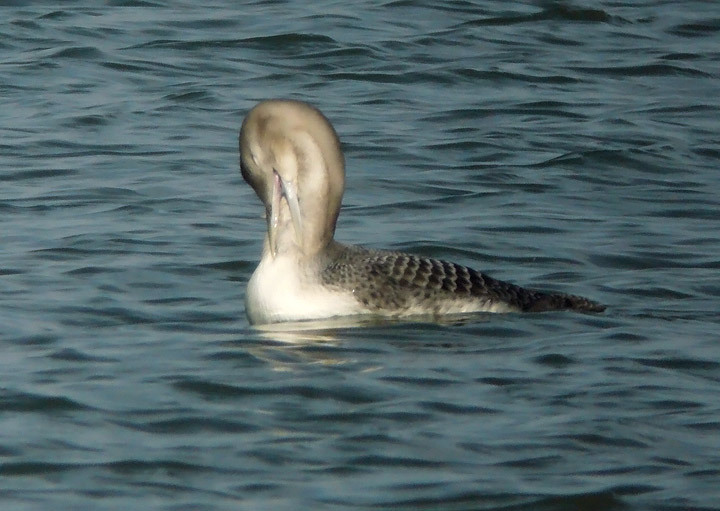 It can open its right eye, but perhaps the neck injury is bothering that eye as well? Whatever the case, hopefully Erie Reservoir will provide the food and rest the bird needs before it ices up. I've been taking advantage of the Thanksgiving break to catch up on lots of stuff, including my photo website. I just completed an update that includes pics from Arizona & New Mexico last late July/ early August. Jump over to take a peek at Ruddy Duck, White-tailed Ptarmigan, Sharp-tailed Grouse, Wild Turkey, Double-crested Cormorant, Turkey Vulture, White-tailed Kite, Red-tailed Hawk, Long-billed Curlew, Sabine's Gull, Rock Pigeon, White-winged Dove, Common Ground-Dove, Greater Roadrunner, Spotted Owl, Broad-billed Hummingbird, Broad-billed x Berylline (?) Hummingbird, White-eared Hummingbird, Berylline Hummingbird, Blue-throated Hummingbird, Magnificent Hummingbird, Lucifer Hummingbird, Black-chinned Hummingbird, Anna's Hummingbird, Costa's Hummingbird, Calliope Hummingbird, Broad-tailed Hummingbird, Rufous Hummingbird, Elegant Trogon, Acorn Woodpecker, Western Wood-Pewee, Buff-breasted Flycatcher, Sulfur-bellied Flycatcher, Thick-billed Kingbird, Plumbeous Vireo, Mountain Chickadee, Verdin, White-breasted Nuthatch, Cactus Wren, American Robin, Aztec Thrush, Hepatic Tanager, Rufous-winged Sparrow, Black-throated Sparrow, Lincoln's Sparrow, White-crowned Sparrow, Blue Grosbeak, Varied Bunting, House Finch, and Lesser Goldfinch. I also put up some dragonflies, butterflies, and herps. Earlier on this blog, I described my digiscoping rig improvements- well, I had to go and improve upon my improvements a little. 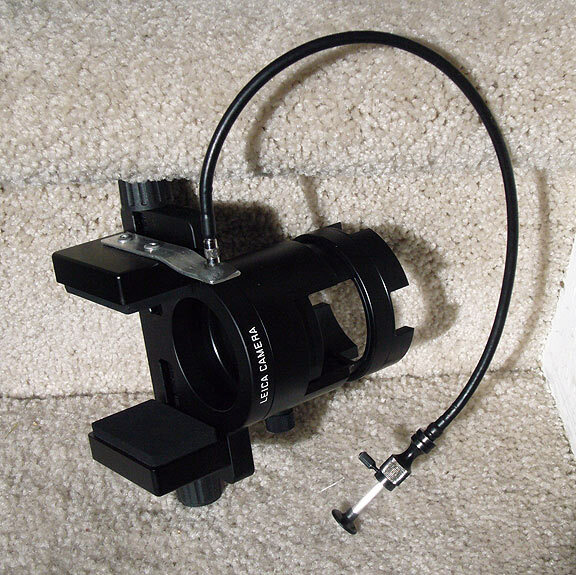 Really, there was only one thing to tweak, and that was the cable release attachment point. 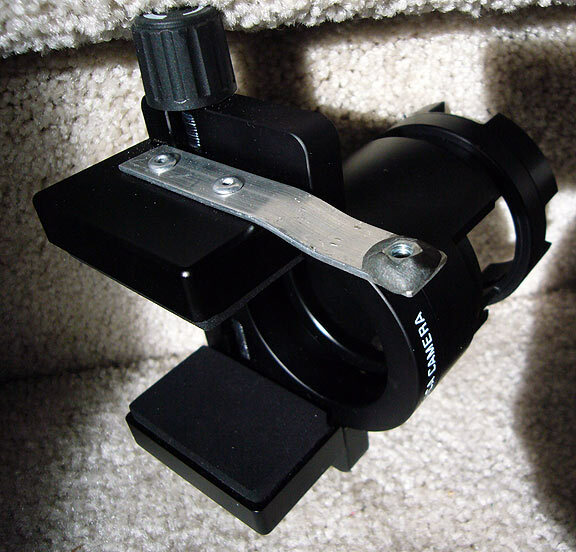 I had just forced the threads into a 1/8" hole in the thin aluminum bracket, which worked OK for a while, but it was getting harder and harder to keep the cable release firmly attached- the hole was getting stripped. So I went to Bolt Canyon at McGuckin Hardware (only the BEST HARDWARE STORE IN THE UNIVERSE, known to Boulder-area folks as just "McGuckin's") with the cable release and voila- one of the guys found a nut that fit the threads perfectly in about 53 seconds- yeah, under a minute. Turns out he had done the match at least once before- goes to show how comprehensively the guys at McGuckin's know their stuff. Pretty nice compared to drifting around a Home Depot feeling small, insecure, and uncared for... Anyway, it was a 4mm nut with standard metric threads, I believe. 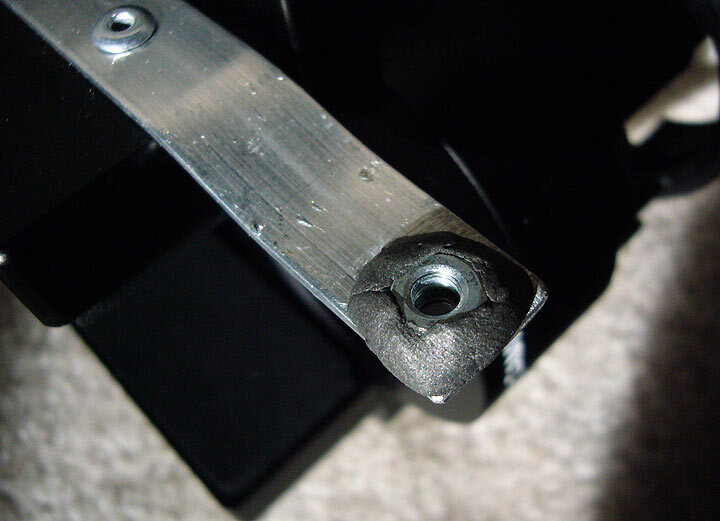 Next, I drilled out the hole a little more for clearance and, lacking a TIG welder, used some PC-Metal Hand Moldable Multi-Purpose Epoxy Putty Stick (also obtained at McGuckin's) to attach the nut over the hole. I ran a 4mm bolt up through the hole and threaded it into the nut so I could pull down on the nut into a small donut I made of the epoxy putty without squeezing any of the epoxy into the threads. Then, once things were looking OK I unscrewed the bolt so it wouldn't get epoxied in by any stray putty (a brilliant ploy if I do say so myself.) I also built up a bit more epoxy putty around the nut so it would firm everything up. Once set (an hour at room temp. ), all I had to do was put a little more bend in the aluminum bar so the cable release actuator could adequately reach the camera's shutter, since the nut created a little more stand-off than I originally had. I've been busy with talks the last couple of weeks- seems like the saying "when it rains it pours" applies to me in this regard- I'll go a while minding my own business but then things will get busy. 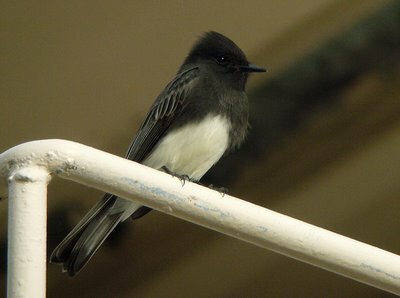 It started a couple of weeks ago when I gave my bird coloration talk (Bird Coloration and the Fascinating Case of Whitey, the Steller's Jay) to the Happy Transplants Garden Club in Westminster. For an encore, I did that talk again last night for the Aiken Audubon Society in Colorado Springs (thanks for having me, folks!) Between these bird talks, I did a Grand Canyon show with 6th grade reading classes at my school for 6 or 7 groups- it all blurs a little bit. I've been presenting the talk since I had the privilege of rowing the Grand Canyon on an 18 day private trip in the fall of 2002. The 6th graders read a book called Downriver, which tracks the adventures & misadventures of a group of teenagers who hijack a van full of rafting gear and embark on their own trip down the canyon- quite the tale, and I gear my talk to show them many of the places mentioned in the book and to give them a feel for what a multi-week wilderness rafting trip is like. Anyway, I love the questions that the kids come up with- they are really into the book and hypothetical questions like, "What would happen if the scorpion stung you?" or "What happens if your boat flips?" But the best part is getting their thank-you notes. I can really see what resonated with different kids and feel the excitement they have about the book, the Grand Canyon, rafting, adventures in general, nature, etc. Thank you for giving us that awesome presentation. I think the scorpion was cool because it was small but deadly. I also think Redwall Cavern and Lava Falls were cool too because Lava Falls looked so freaky and scary. I liked Redwall Cavern because it had red walls. Anyway, thanks again. I want to do the Grand Canyon now, maybe later but it looked fun. Thank you for the slide show. The rafting looked cool. The scorpion slide scared the crap out of me because I'm going backpacking down the Grand Canyon. Did you have hamburgers at the Phantom Ranch? The slide show was awesome except the scorpion slide that scared the crap out of me. Thank you for all of the information about whitewater rafting. I liked all the things you showed us and the Grand Canyon is very pretty. I'm glad you took all those pictures and put them in a slide that way we could see how wild and awesome it was. I wish you could feel how I felt I can't explain it! You should go to different schools and show them that slide show because it was the best I've ever seen. I think my favorite parts were seeing all the rapids, scorpions, and all the unique stuff. I've never been to the Grand Canyon and it was awesome to finally get to see what it looks like. I just wanted to say thank you and I had a great time hearing you talk about your adventures in the great Grand Canyon. p.s. Thank you, thank you, thank you. Now who says middle-schoolers never show their appreciation! Thanks to you, too, C____!!! Finally, here's a note that really sums up why I like to do talks like this- you never know when somebody will really key in to the environmental thing. The pictures of the Grand Canyon and the way you described it to us made it sound like the most amazing adventures and most beautiful place in the world. When I'm in my twenties I want to go down the Grand Canyon to see it for myself. I'm not sure you agree with me, but I think there is so much man-made beauty in the world but you can never capture the beauty that nature holds. It made me happy to see some parts of the world haven't been polluted or littered and have been the same for hundreds of years. The animals there in the pictures seemed happy to be there also. I appreciated this very much. I added the bold font on my favorite part- how cool was that? Kind of gets at why some of us get so obsessed with birding, doesn't it? 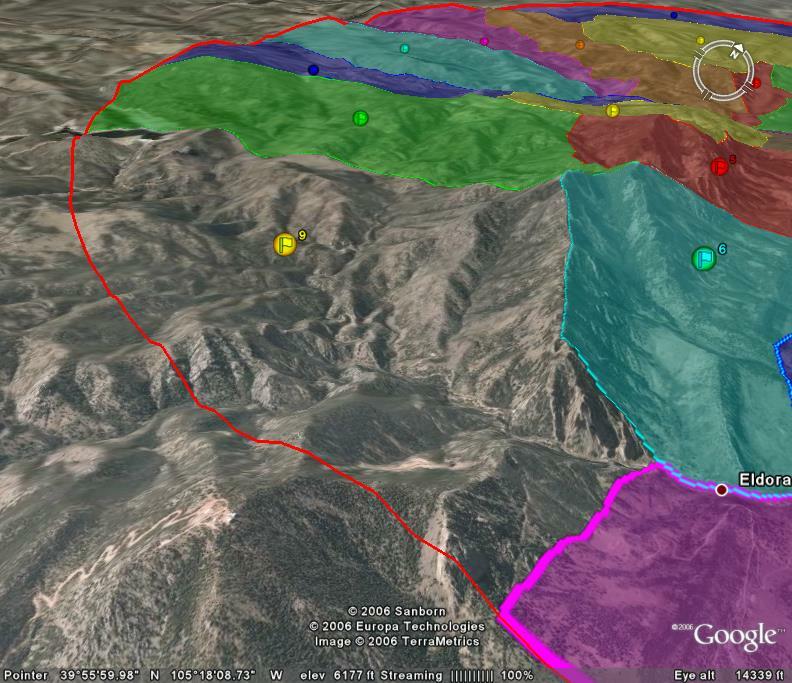 OK- I went a little crazy last weekend and plunged into Google Earth some more. I wanted to map out the 30 (!) territories in the Boulder Christmas Bird Count circle that I compile (see previous post for details of my initial foray into plotting CBC circles...) Part of this was to clean up historic boundaries a bit, making sure they followed logical features when roads aren't available, using ridge lines, drainages, neighborhoods, etc. I also wanted to exclude the Longmont CBC incursions into our circle. Update: The free version of Google Earth now has the drawing tools needed to accomplish the following steps- yea!! 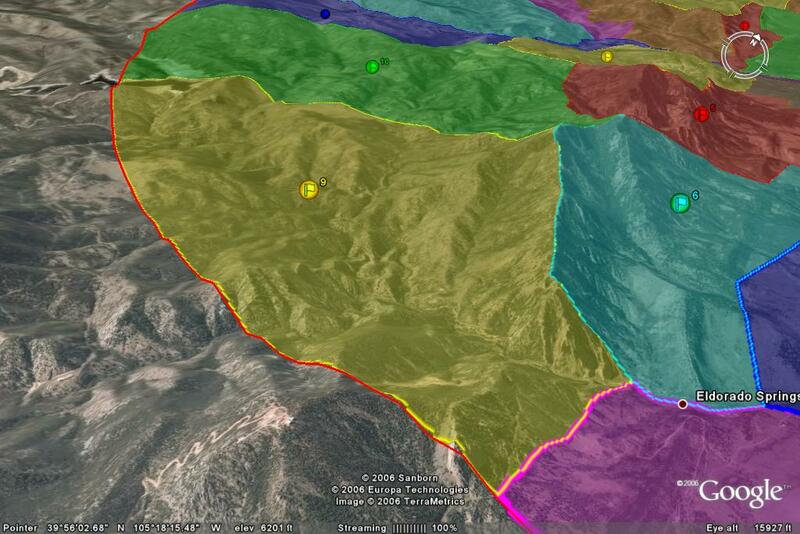 1) While Google Earth Plus is needed to draw the polygons, the free version is fine for viewing and exploring them. 3) While there are 30 territories, you will note that they are numbered 1-32, with 11 and 18 missing. They were folded into other territories over the preceding years, but the original numbering was kept on the remaining territories to avoid confusion. 4) To explore a territory, you can zoom in to that area, pivot the compass heading &/or tilt the viewing angle to your heart's content. For example, zooming in to territory # 9 (Eldorado Canyon) & changing the viewing perspective & tilt might look like the following. You can see the relationships between this territory and its neighbors, what features define the boundaries, where the count circle radius intersects roads, etc. 5) The shading is nice for defining all of the territories, but might be annoying when you are trying to see details of the territory you are interested in. You can edit the amount of shading by selecting the territory, right-clicking, selecting "properties (pc) or "get info" (mac), choose the "style, color" tab, and changing the amount of shading (it is now at 40%.) Even better, you can uncheck that territory, which will take out all of the area shading. 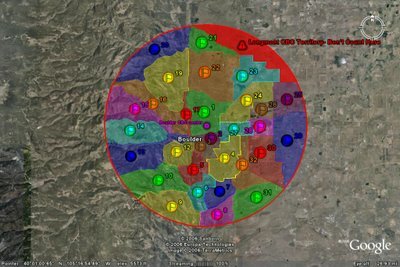 Since the circle and surrounding territories are still selected, you can see your territory just fine without the coloring. Here's territory 9 again, without the shading. Remember that if you are really running Google Earth, you can zoom way in for details, move around, etc. Let me know if you want me to send you the .kmz file to play with, or if you have other/better ideas for setting up Christmas Counts using Google Earth. Any birder has tools that they would consider critical, like their binocular, scope, field guide, map with details of back roads, etc. I'd like to propose another tool that no 21st-century birder should be without-- Google Earth. A free download (http://earth.google.com/), this software lets you virtually explore the Earth's surface at up to 1-meter resolution from your computer. So beyond the gee-whiz possibilities, why is this a great birding tool? Here are some applications I've used it for in the last several months. 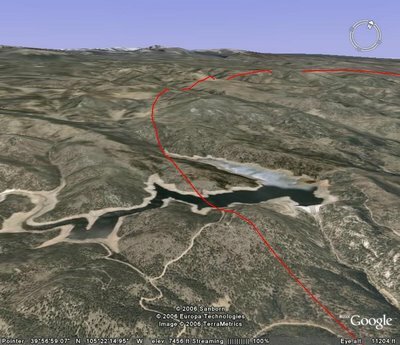 Anybody else have a great way to use Google Earth for birding? If so, leave a comment. 1) Giving directions to other birders. Once you've been birding, especially in off-the-beaten-track areas, and you are trying to explain to somebody where that great bird or birding habitat was, Google Earth is worth more than the proverbial 1000 words. You just find the spot you were birding, create a place mark, save it at a .KMZ or .KML file (I'll admit I don't know the difference between these two but they both seem to work), and email it to whomever needs it. They open the file, which takes them to the spot in their own Google Earth window. In a variation on this theme, I helped some out-of state birders this past summer who called me for directions to a spot where Mike Freiberg and I found with a good bug- Theano Alpine. I made a place mark, jotted down its lat/long coordinates, and phoned them along to the visitors. They punched the digits into their GPS and followed them right to the meadow hosting these Colorado specialty butterflies. 2) Planning trips. Of course, sometimes you are on the receiving end of directions, either given to you directly or by trying to glean them from a list serve, birding guide, or whatever. Google Earth lets you virtually fly there and check out the lay of the land, generate GPS coordinates or driving directions from where you are, etc. before you head out. 3) Documentation. What do I mean by this? When documenting a bird's location, several details are often requested like the exact location, elevation, and distance to the bird. This used to take some time to and several references to figure out. Now I can just find where the bird was and where I was seeing the bird from, mark both, and get all of the info I need within the Google Earth window. (There is a ruler feature, and you can show the lat/long and elevation of your cursor position in the bottom of the window.) The ruler can also be used to connect points into a path if you are curious to see how far you walked, drove, or whatever. You can also send yourself a screen capture if you want to include a picture of where the bird was. 4) Locate borders. Into county/state listing but not sure where which side of the line you were ticking those birds in? 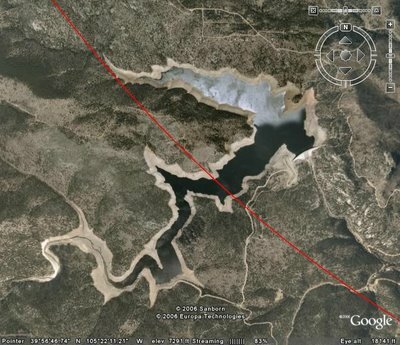 Google Earth has a layer that shows these borders. 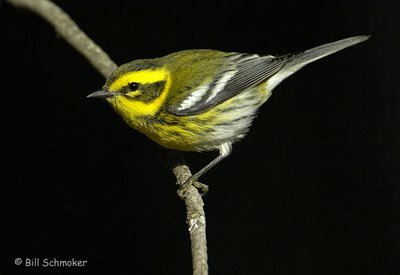 5) Explore a birding area. Ever wonder about the layout of a patch of woods, ponder the geography of a migrant trap, or wanted to see what's behind those "No Trespassing" signs? Google Earth lets you do this from whatever elevation, compass orientation, or viewing angle you want. It is almost like having a helicopter at your disposal without the big rental bill. 6) Set a Christmas Count circle. Mark Peterson turned me on to a really easy way to lay out a Christmas Count (or check existing count circles that were probably drawn with a compass on a map.) Following the easy directions at Bootstrap Analysis, you just set the center of your circle, get the lat/long coordinates in decimal form, and follow the links to set your 7.5 mile radius and generate the .KML file with your circle. Opening the file takes you to your count circle in Google Earth. This is extremely accurate & cool! 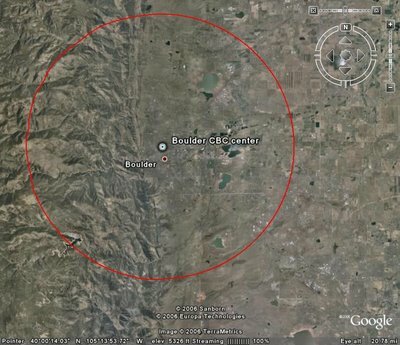 Here's an example using the Boulder, Colorado CBC. In the first screen shot, you can see the dimensions of the whole circle. 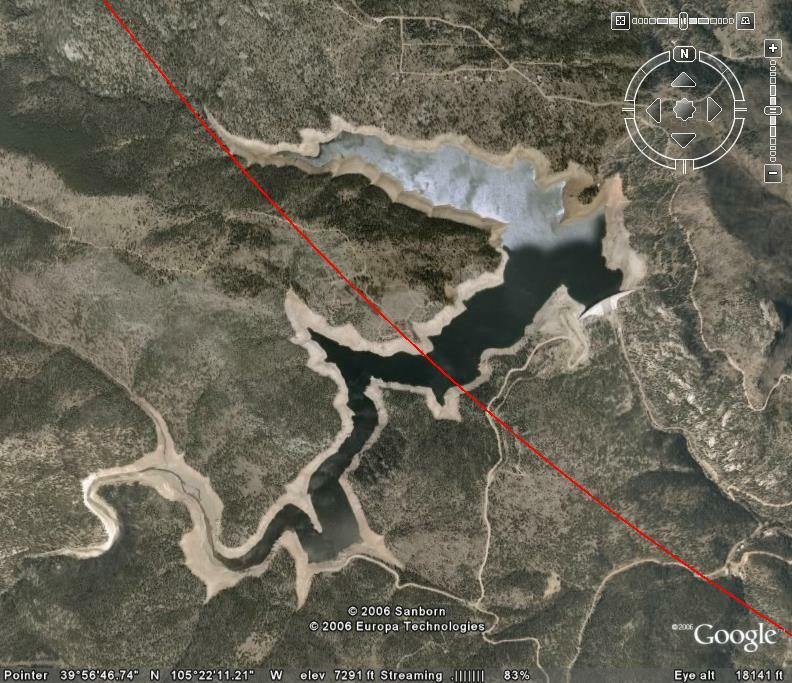 Zooming in to the SW corner, you can see exactly which parts of Gross Reservoir are in or out of the count circle. 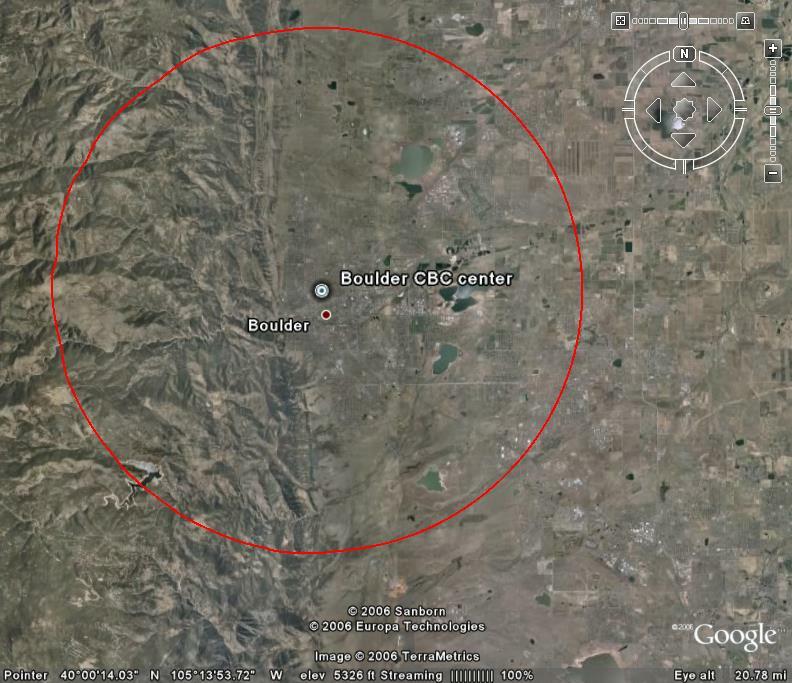 If you want to play with this, download the Boulder CBC circle .KMZ file here. I'm feeling like I have my new digiscoping rig dialed in now. 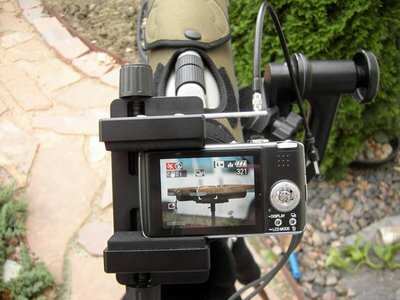 While I prefer to use my DSLR rig (Nikon D2x + 200-400mm f/4 VR, etc.) for bird photography whenever possible, there are many situations where digiscoping still rules. 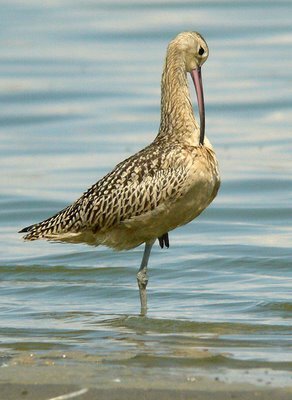 For example, last weekend my dad Jim & I re-found a young Brown Pelican that has been hanging around Colorado's northern Front Range all summer. The Colorado Bird Records Committee wants documentation of this rarity, a process always made easier with a photo. 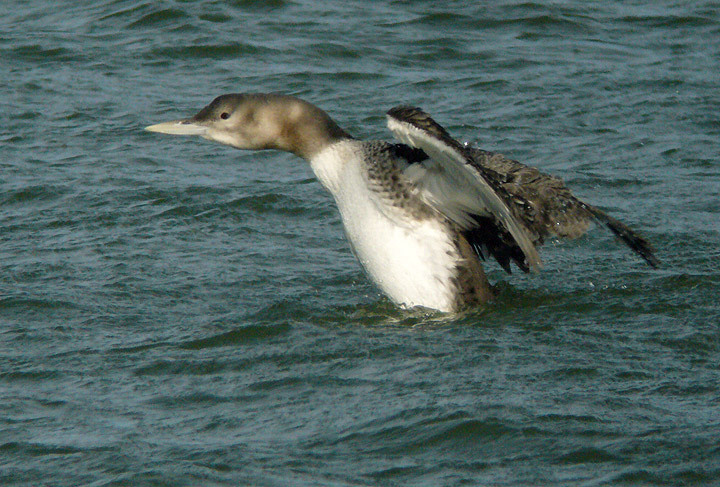 Unfortunately, we were seeing the bird from over 1/2 a mile away, well beyond the practical range of the DSLR. While it won't make the next cover of National Geographic, I could obtain an identifiable photo even at that extreme range with my digiscoping rig. Still, there were times when I missed the ability to fire the camera remotely. 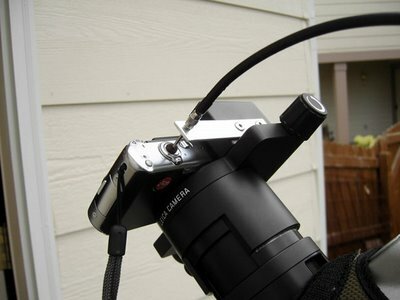 On a previous set-up, I had used a cable release bracket made by EagleEyeUK to fire my Nikon Coolpix 4500. After using the C-Lux 1 / Digital Adapter 2 rig for a while, I realized that by adding a simple aluminum extension on the top of the adapter, I could use a cable release to accomplish hands-off digiscoping (and thus minimize shake, the ultimate enemy of high-magnification photography.) To accomplish this on my new rig, I just used some thin aluminum bar stock, riveted it on the top of the adapter, and drilled a hole above the shutter to accept the cable release. I put a spot of self-adhesive felt on the shutter button so the cable release actuator wouldn't slip around, and used a small wood screw to taper the hole and have some starter threads for the cable release tip to bite into. Lastly, I slightly bent the aluminum bar down towards the shutter to compensate for the tendency of the cable release to push the thing up. 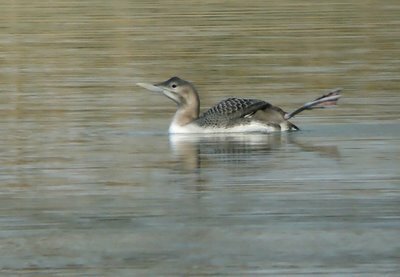 So now I'm feeling like I can worry about the bird, and not my equipment, when I'm digiscoping- a state of photographic nirvana. Jeff Bouton coined the term, "digi-schmokin'" when we were blasting pics left and right on our World Series of Birding digiscoping big day. 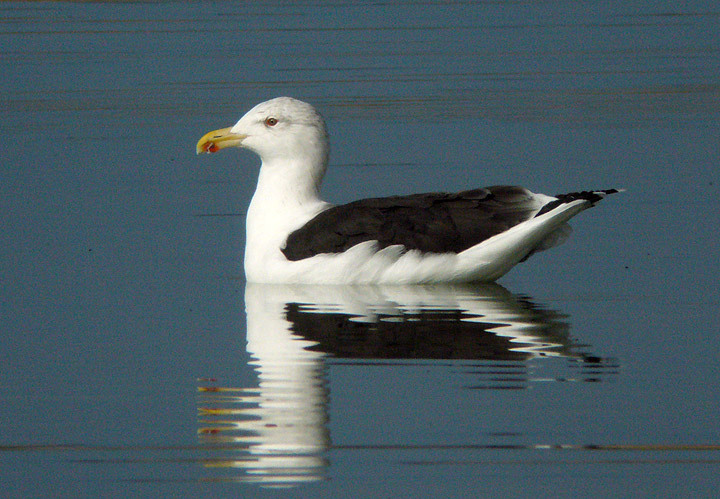 I like the term, capturing the gestalt of digiscoping with confidence and success. 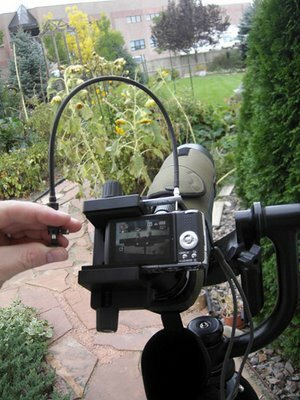 With my new rig now dialed in, I'm confident I can get in the digi-schmokin' zone whenever I've got birds in my sights.